River Song will also make an appearance in “The Angels Take Manhattan” which perhaps not coincidentally is the episode before Oswin’s debut as companion. Going against this theory is the fact that River died and was upload to a virtual world in “Forest of the Dead” but what can be uploaded can be downloaded. Also the Doctor didn’t know she could regenerate, which she could have done after he left like his clone Jenny in “The Doctor’s Daughter.” Although River allegedly used up all her regenerations in “Let’s Kill Hitler” that’s impossible to confirm. River isn’t a Time Lord therefore their rules don’t apply to her. Finally, Time Lords can chose their appearance during regeneration so River could regenerate into Oswin and then back to maintain existing canon. Stranger things have happened. The name Oswin Oswald could also relate to the Weeping Angels that appear in “The Angels Take Manhattan.” Oswin means “God’s friend” and Oswald means “God’s power.” Angels are both God’s friend and power. Even if she’s not related the Weeping Angels, the repetition of God clearly indicates she isn’t merely human. Space IKEA had a sale. 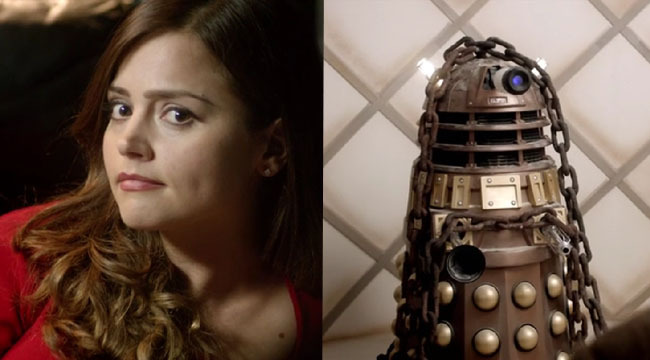 It’s also interesting that Oswin’s chair is nearly identical to Jenny’s chair but that’s probably just a coincidence. It would conflict with Oswin’s declaration of her humanity after memories return. 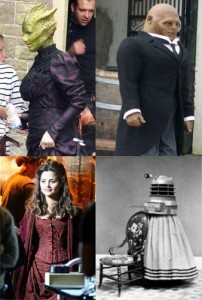 Madame Vastra (Silurian), Sontaran, Dalek in a dress, Oswin Oswald, (clockwise from top left). 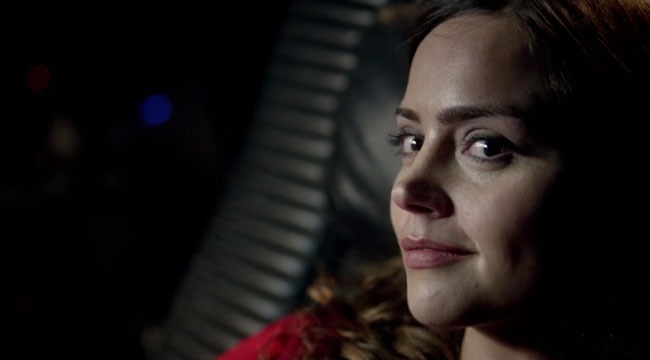 There’s some speculation that the new companion, who was rumored to be named Clara, will be a relative since Oswin presumably dies at the end of the episode when the planet explodes but even if she died, the new companion could still be Oswin. Her final words suggest they have met before. “Run you clever boy and remember,” she tells the Doctor while looking into the camera and breaking the fourth wall. The Doctor constantly uses the adjective “clever,” while “remember” could mean that he’s forgotten her. Unlike with River Song where their interactions were out of order, perhaps this will be a prequel of a forgotten companion who joined the Doctor during his time away from Amy and Rory. A previous relationship is also hinted when Oswin plays the famous aria from the opera Carmen known as “L’amour est un oiseau rebelle” (“Love is a rebellious bird”). Upon hearing the music the Doctor comments that he played the triangle, which could be double entendre since the opera is about a love triangle. The opera is from the Victorian era which Oswin was spotted in during production along with Madame Vastra, a Silurian, and a Sontaran dressed in Victorian era clothing photos (left). The conspicuous looking aliens are presumably using a perception filter to appear human. That could also be the case with Oswin so she might still be a Dalek or she could have transformed herself into one of the human looking Daleks. Remember that Daleks have an emergency temporal shift, which would have allowed her to escape the destruction of the planet. If she did escape she would have most likely hitched a ride with the Doctor on the TARDIS, which the “very last place” the Doctor would expect to meet his new companion. 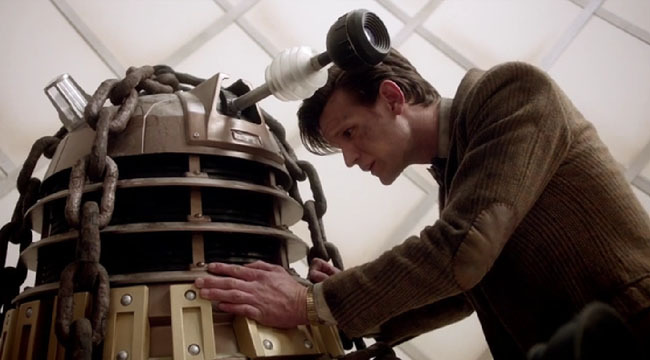 If there is a Dalek stowaway, there will likely be clues like things out of place in the TARDIS. Regardless of whether if this theory pans out, I like the idea of a Dalek companion so much that I decided to do a Doctor Who webcomic, which will be up shortly. In “A Town Called Mercy” the Doctor says he is over 1,200-years-old. That is significantly older than the either the 909-years-old Doctor or the 1,103-years-old Doctor, who was killed in “The Impossible Astronaut.” It seems the Doctor has had many adventures in this time apart from Amy & Rory, which would correlate to the forgotten companion theory. Later in the episode, the Doctor disperses a mob saying, “frightened people, gimme a Dalek any day.” This could be a hint that Oswin will travel with the Doctor as a Dalek. In the Christmas special “The Snowmen,” Madame Vastra asks Clara to explain in one word why the Doctor should help her. “Pond,” she answers. The implication is that Clara has some connection Pond family. Of course if she were River Song she’d probably say “River” or “Song.” What if Amy and Rory had a second child? Then again, it’s possible Clara was just referring to the pond from which the ice woman emerges. Whether or not Clara Oswin Oswald is River Song should be confirmed when Alex Kingston returns in the season 7 finale. David Tennant and Billie Piper will return in the 50th Anniversary Special November 23, which just happens to be Clara’s birthday, as revealed on her tombstone in “The Snowmen.” Could Clara be the daughter of the human Doctor and Rose? The forgotten companion theory has all but been confirmed. Coleman told the BBC, “All I can say is that Clara hasn’t just met the Doctor three times before…” In fact, the trailer for the season finale shows Clara with Bessie, the Third Doctor’s car. When I was watching “The Angels take Manhattan” last week. Something just hit me about the Oswin being River theory. In TATM River is pretty upset about how the doctor hates endings and insist on the face of a twelve year old and all that. Then she tells Amy to never let him see her damaged or age. It soulds like it could be leading us think of her regenerating and being younger. Then at the end the doctor seemed very sincere in his request to have River travel with him. If she becomes Oswin she will. About the two’s timeline mess. I wonder if she got out of the computer and regenerated, did it cause the two’s timeline mess to get straitened out so she can be on the same timeline as him? Then I got to thinking. More about Oswin vs. River. Both of their first episodes they die. 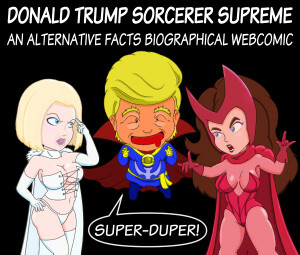 Both know him in those first episodes, but he didn’t know them. Both are trapped (in a way) inside computers, afterall (Daleks) robots are animated computers. Then I thought of funny today when my father and I were watching the Back To The Future trilogy. When we got to the third I cracked out laughing. My father thought I had gone insane. I told him what the rumored name is for the upcoming new canpanion. He got the reference and started laughing also. Doc Brown married to Clara Clayton (Doctor & Clara) then The Doctor married to River (Oswin/Clara). Both about time travel. If the theory about River and Oswin turns out to be true than that must have been intentional by the Moff. I mean. Come. On. Then about the name change from Oswin to Clara. It’s not like it hasn’t happened on Doctor Who before. Who is a fantastic, awesome character we love who has had two names (Not counting her author name Melody Malone)? Of course, River. This one is alittle iffie. My father asked me this one. In TATM when the doctor healed River’s wrist. Did he give her enough time energy back for her to be able to regenerate again at least one more time? I personally am not sure entirely. To me it didn’t look very bright and when regenerating their is alot of light. In relative terms could the amount he used on her equeal the amount it takes for a full regeneration? My mind is wanting to say no, but my heart wants to say yes! Well there you are. My two cents. Thankfully, Xmas special is almost here but I have a feeling Oswin’s origin might not be fully revealed until end of the new series/season.